Located in Marina del Rey, Guidance has been named (yet again) as one of the BEST PLACES TO WORK in Los Angeles. That’s a tall order because out of 400,000+ companies in Los Angeles County, only 100 are awarded this honor. Guidance develops fully-integrated eCommerce sites, mobile applications, enterprise solutions and support services. These guys have major clients including Footlocker, Burlington Coat Factory, RayBan, Murad, TOMS Shoes, Tissot, Ticori, Coffee Bean and many more. 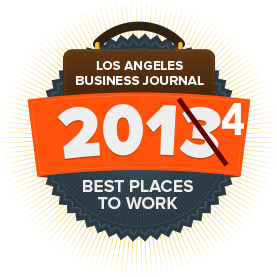 Awarded by The Los Angeles Business Journal for being one of the Best Places to Work in L.A.
Won in 2008, 2009, 2012, 2013 & now 2014!